Unlike the tradition of the Old Kingdom and the Middle Kingdom the main elements of the buildings for royal funeral cult, the burial chamber (with mummy and burial offerings) and mortuary temple became separated from each other with the beginning of the New Kingdom, i.e. with the 18. Dynasty. The burial took place hidden in the well-guarded Valley of Kings (Biban el-Molûk) whereas the cult place was erected at the edge of the desert, in the direction to the Nile. For the royal cult frequently magnificent temples were established (e.g. the Ramesseum, Medinet Habu, and the largely destroyed temple of Amenhotep III) which were dedicated to the king as well as also to Amun as the "King of Gods". 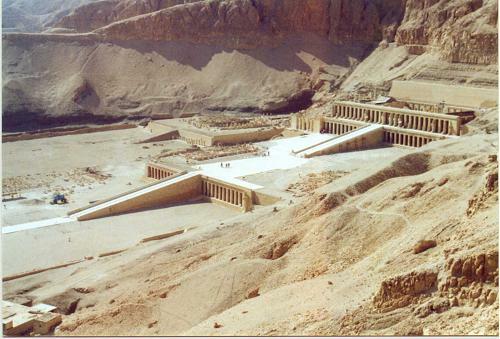 The temple of Hatshepsut - which probably was begun originally for her father, Thutmosis I (s. a. history of the building) - lies at the west bank of Thebes, in the valley of Deir el-Bahari which was an old place of worshipping Hathor, principal goddess of the West. Therefore, apart from the main god Amun this temple was also dedicated especially to the goddess Hathor and the embalmer god Anubis (both are worshipped in own chapels). Besides that there is a small sun-temple for Re-Horakhty. Apart from the admiration of Hathor also the admiration of her predecessor Mentuhotep II Neb-hepet-Ra who had ruled approximately half a millenium before Hatshepsut may have had - in the opinion of Dodson (1989) - influenced the choice of the place. The museum of Liverpool is in the possession of a large (approx. 9.3 x 5.5 cm), shell-shaped stone (possibly of aragonite) which carries on both sides roughly cut, but nevertheless clearly readable hieroglyphics. Beside the cartouche of "Maat-ka-Ra" the text contains in the second row also the cartouche of "Neb-hepet-Ra" (see illustration left). 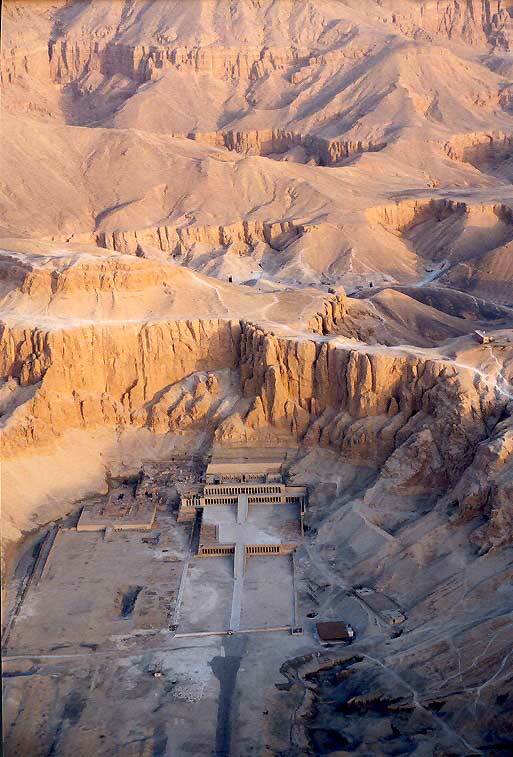 The text reports about the restoration of his temple accomplished by Hatshepsut. However, it is not certain that the text refers to restoration work on his temple at Deir el-Bahari. The "modern" history of the stone can be traced back to its purchase between the years 1830 to 1839 - the buyer and owners at that time, J. Sams, published this object together with others in 1839. In between the stone was regarded as a falsification, however, after a new evaluation in the meantime it is regarded again to be authentic. Against a falsification speaks the fact that only 20 years after the publication by Sams the close location of both temples at Deir el-Bahari became known. However, the circumstances of the discovery of the stone are not known, its connection to Deir el-Bahari is based only on the fact that in several "foundation-stone deposits" of her temple Djeser djeseru similar shell-shaped stones - with a dedication for Amun - had been found. The temple opens to the east when the visibility is high one can make out from the 3rd terrace the 1. pylon of Karnak temple and the obelisk of Hatshepsut. From the temple forecourt a cause way leads straight to the Valley Temple of Hatshepsut at the edge of the marches, from there to the Nile and on the other river side to the large temple of Amun. On this way also the procession with the holy barque of Amun reached the temple when Amun was staying at Djeser djeseru during the "Beautiful Feast of the Desert Valley" (= "heb nefer en inet"). The approx. 1 km long causeway between Djeser djeseru and the valley temple was lined with sandstone sphinxes which represented lying lions with the head of the queen. Halfway was a bark shrine in which the holy barque of Amun stopped for ritual cleanings. Not much has survived from this way-station. Beside the place where it had been erected it could be reconstructed that it was built on a platform. Stages at the east and at the west side suggest that both sides had gates. On the way to Djeser djeseru the barque of Amun was carried in through the eastern gate and put on a pedestal. Furthermore, it could be reconstructed that the way-station had a circulating portico of pillars. In front of the way-station two Osiride statues of the queen had been erected on the eastern side against the front pillars (see also way-stations of the Opet-Festival along the causeway from Karnak to Luxor temple). Beyond that at the corners trees had been planted in square pits filled with Nile mud. The "Valley Festival" of Amun was celebrated on the new moon of the 2. month of the summer "Schomu"; i.e. the 10. month of the solar year. The following plan shows beside other procession ways (e.g. that of the Opet Festival) the way to "Beautiful Feast of the Desert Valley" at Djeser djeseru. Escorted by of priests, servants carrying burning incense, musicians, dancers, acrobats, soldiers and probably by inspired inhabitants of Thebes the splendid barque with the shrine and the statue of Amun was carried from Karnak temple over the causeway to the bank of the Nile. On a splendid ship called "userhat" - that means something like "The powerful Bow" - the shrine with the statue of the god was ferried across to the west bank to a small temple that today is completely destroyed. Thereby, Amun was accompanied by other magnificently decorated barks and ships for the two other gods of the triad of Thebes, Mut and Khons. After various rites had been performed in the small temple the procession went directly to the valley basin of Deir el-Bahari. En route the procession stopped at bark shrines so that Amun - and his carriers - could rest. At Djeser djeseru Amun was carried through the temple's garden with ponds and shady trees - most likely brought from Punt (the stumps are found in the meantime and lay enclosed before the 1. Terrace) - to his resting place hewn into the mountains at Thebes-West. Here the rites were accomplished and the offerings were mounted in front of him. During the night that Amun spent in the temple the people of Thebes celebrated the "reunification" of the living with their deceased ancestors. Furthermore, the people of Thebes brought flower arrangements to the temple which were mounted there overnight around the god's statue. "Charged" with the "magic forces" of Amun these flowers were then brought into the cult chapels of the deceased, so that these also could take up the "power" of Amun. Thus, the "Beautiful Festival of the Desert Valley" of Amun was essentially a "remembrance ceremony of the deceased" who were visited at that opportunity by their still living relatives. 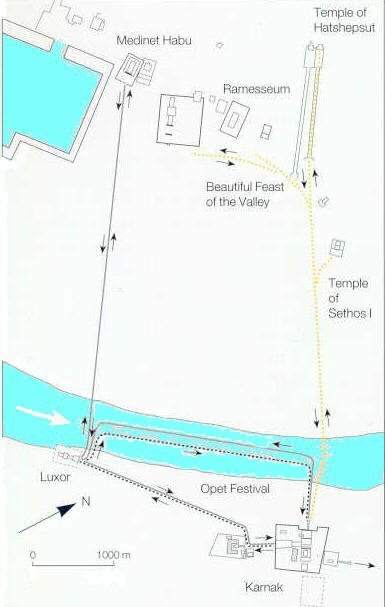 However, the highlight of the "Valley Festival" took place at Djeser djeseru only for a few years since Thutmosis III tried celebrate the festival in his today completely destroyed temple, Djeser achet, which he had built between the old temple of Mentuhotep II and Djeser djeseru. However, this change could not be maintained and Djeser djeseru became the center of the "Beautiful Festival of the Desert Valley" of Amun for long time again. Also the goddess Hathor was a temporary guest at Djeser djeseru, most likely during the journey of the "Hathor of Dendera" to her husband, the "Horus of Edfu". A relief in the Chapel of Hathor shows the arrival of the procession with the holy barque of Hathor.